Do you remember that kid who always got picked last when choosing teams back in gym class? The one who might be wide open (no one guarding them because they didn’t need to), but if you do chance it and throw them the ball, they choke? Yeah, that kid was me. I was terrible at catching any kind of ball. And, truth be told, I’m still not great at it. My husband has stopped throwing me the remote because I can’t catch it. And a broken remote is not fun for either of us. But although I’ve never been athletically talented, I have always been active and really enjoyed being outdoors. Growing up, there were always kickball games, relay races, tree climbing contests, bike riding, roller skating and skateboarding . When we were at our family place in the Adirondacks, the days were filled with climbing mountains, rowing and endless swimming. But when you become an adult, those days of endless activity fall by the wayside. I moved to Nashville in 1996. In the fall of 1997, I was asked to be a last minute replacement for someone who had dropped out of my company’s Corporate Challenge team. I was supposed to run a mile. I didn’t even have running shoes and started my training wearing an old pair of Keds. Mark, the team leader, quickly suggested that I get myself outfitted with a pair of running shoes so I went to a local big box sporting goods store and was outfitted with a pair of Asics running shoes. I don’t recall doing much training before the event except for a couple of running attempts, none of which covered a whole mile. On race day, Mark ran right beside me, encouraging me as I struggled to run the whole mile. 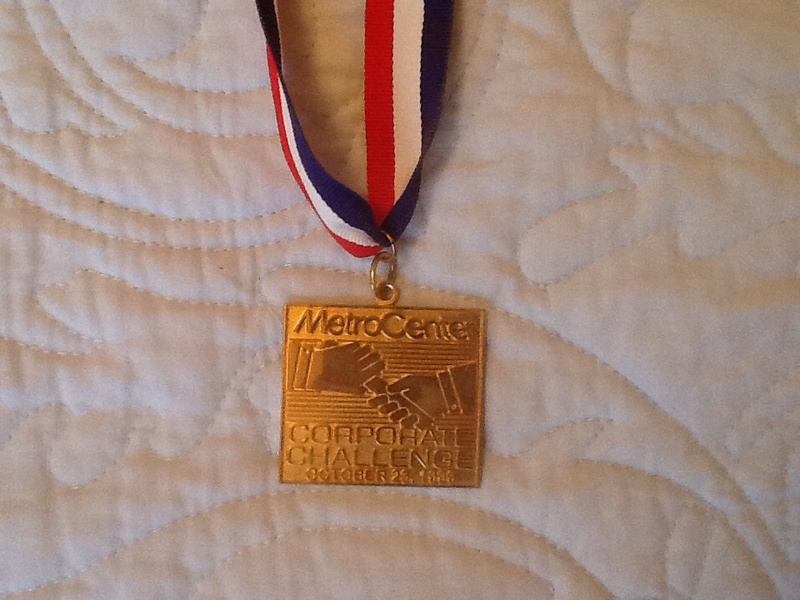 I ran on the company Corporate Challenge team for the next couple of years. In 1999, I actually put some effort into my training with the other women running the event. This time, the 3 of us finished together in 9:30 and won 1st place. I was so thrilled that I wore my medal the rest of the day! I ran intermittently for a couple of years, but those runs got less and less frequent and, finally, non-existent. Then I turned 40. I can’t speak for everyone, but my metabolism finally caught up with me and I gained 20 pounds during a six month period. As I was struggling to lose the extra weight, I remembered how great I felt when I was running and made a New Years resolution to start running again. That was 10 years ago and I’m still at it. All these years later, even though we no longer work together, I still see Mark occasionally at races or group runs. He’s one of Nashville’s best runners and I’m proud that he was the person who ran that first mile with me and helped me win that first medal. If one of the goals of this blogging adventure is to share my gratitude for the gifts running has given me, it needs to start with Mark. I attempted to thank him in person, but, to my embarrassment, tears welled up and I couldn’t get the words out. Maybe it’s because there aren’t really enough words to thank him for this enormous gift. Instead, I’ve tried to pay it forward by being a mentor to beginning runners. Because all of us need to start somewhere, right? I love Karma! I don’t know if I have ever told you, but you were definitely a running mentor for me. I am very grateful for our friendship that sprang from running! Love you sweet friend! Good stuff. We have all come a long way with our lives through running.